Cluster Bomb from Bomb Seeds are cannabis seeds that are feminised. Cluster Bomb is the reason whereby Bomb genetics has become famous. This weed strain ensures a very high yield, it grows fast and is very powerful. This nice weed strain is developed by using the original Sensi Skunk #1 and the legendary Assepoester 99 that thereafter was crossed with our own excellent Bomb #1. This has resulted in a nice weed plant that contains mainly Indica genetics. Bomb Seeds Cluster Bomb is a very powerful weed strain. This weed plant is appropriate for an indoor grow and outdoor grow. Because of the dominant Indica genetics, this plant has a shorter, denser structure if you grow this plant indoor. The exceptional high flower-leave ratio indicates that this weed strain produces large clusters with big dense buds. She is appropriate for a SCROG or SOG grow. 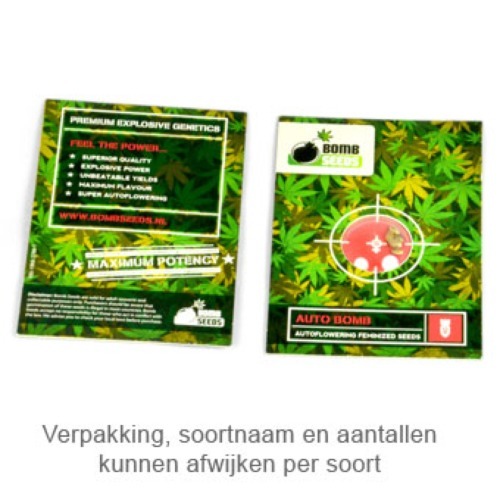 Growing cannabis from these feminised cannabis seeds provide you a delicious weed! The effect of smoking this weed is a powerful physical relaxed feeling. The smoke is nice, and the taste has a skunk aroma with elements of oranges and strawberries. The effect is intense and persists for a long time. Tell us and our customers what you think of the Cluster Bomb from Bomb Seeds.